From crafts to clothes to home decor, shops in Buzios have everything for the hungry buyer. Buzios is shoppers’ paradise. Local artisans are proud to show off their handiwork and international designers are showlighted at many of the boutiques. From the bizarre to the sophisticated, there is something to appeal to every taste. Quite a few of the best shops are located on the Rua das Pedras but do venture out beyond this area for some great deals. The Brazilian Real is accepted at all the shops, as it is the local currency. Clothes shopping is quite fun in Buzios. Small sophisticated boutiques and large city franchises can be found throughout the city. Stop in at the Travessia dos Arcos Gallery for some very comfortable summer wear that is quite popular with the young people of Buzios. Or find that string bikini over at Lenny’s. Aqualung is another franchise clothing store that has its roots in Buzios and is dedicated to protecting wildlife. For the men, Richard’s has some very expensive and couture suits and casual clothing. Stop by Tenda near the Bardot promenade. This shop is quite large and has over 14 Brazilian brands that are very popular throughout the country including clothing, jewelry and home décor. There are quite a few furniture stores specializing in the tropical beach look. At the very end of Rua das Pedras is Edno Decorações. There the focus is on native materials and natural furniture that blends in with the beauty of the rainforests. Stop in Bromélias near Manguinhos to choose from lovely flowering plants or outdoor furniture. Down the road a bit is Casa Nativa with more elaborate furniture made out of recycled materials such as wood and iron. For shoppers who like the nautical theme, check out Cachaça a Bordo located on Rua das Pedras. Located at the entrance of the Galeria das Bruxas this beautifully decorated storefront draws the young and old through its doors. 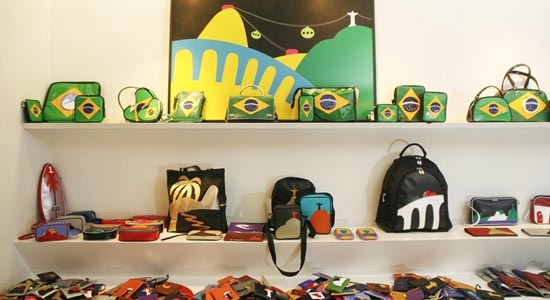 Âmbar, also on the Rua das Pedras, is an eclectic collection of items from all over the world. Arte Marinha, in the same area has artwork inspired by the ocean. Regardless of where you are in Buzios there is sure to be a small boutique or souvenir shop nearby. There are some incredible pieces of native artwork to be found and the prices in most of the shops are reasonable and quite affordable. Bringing home a souvenir or two will not hurt your travel budget.